In June of this year, to commemorate the 100th anniversary of the publication of Einstein's original paper on special relativity, I wrote a Monday Musing column in which I attempted to explain some of the more salient aspects of that theory. In a comment on that post, Andrew wrote: "I loved the explanation. I hope you don't wait until the anniversary of general relativity to write a short essay that will plainly explain that theory." Thanks, Andrew. The rest of you must now pay the price for Andrew's flattery: I will attempt a brief, intuitive explanation of some of the well-known results of general relativity today. Before I do that, however, a caveat: the mathematics of general relativity is very advanced and well beyond my own rather basic knowledge. Indeed, Einstein himself needed help from professional mathematicians in formulating some of it, and well after general relativity was published (in 1915) some of the greatest mathematicians of the twentieth century (such as Kurt Gödel) continued to work on its mathematics, clarifying and providing stronger foundations for it. What this means is, my explication here will essentially not be mathematical, which it was in the case of special relativity. Instead, I want to use some of the concepts I introduced in explaining special relativity, and extend some of the intuitions gathered there, just as Einstein himself did in coming up with the general theory. Though my aims are more modest this time, I strongly urge you to read and understand the column on special relativity before you read the rest of this column. The SR column can be found here. Before anything else, I would like to just make clear some basics like what acceleration is: it is a change in velocity. What is velocity? Velocity is a vector, which means that it is a quantity that has a direction associated with it. The other thing (besides direction) that specifies a velocity is speed. I hope we all know what speed is. So, there are two ways that the velocity of an object can change: 1) change in the object's speed, and 2) change in the object's direction of motion. These are the two ways that an object can accelerate. (In math, deceleration is just negative acceleration.) This means that an object whose speed is increasing or decreasing is said to be accelerating, but so is an object traveling in a circle with constant speed, for example, because its direction (the other aspect of velocity) is changing at any given instant. Get ready because I'm just going to give it to you straight: the fundamental insight of GR is that acceleration is indistinguishable from gravity. (Technically, this is only true locally, as physicists would say, but we won't get into that here.) Out of this amazing notion come various aspects of GR that most of us have probably heard about: that gravity bends light; that the stronger gravity is, the more time slows down; that space is curved. The rest of this essay will give somewhat simplified explanations of how this is so. Just as in special relativity no experiment that we could possibly perform inside a uniformly moving spaceship (with no windows) could possibly tell us whether we were moving or at rest, in general relativity, no experiment we can possibly perform inside the spaceship can ever tell us whether we are 1) accelerating, or 2) in a gravitational field. In other words, the effects of gravity in a spaceship sitting still on the surface of the Earth are exactly the same as those of being in an accelerating spaceship far from any gravitational forces. Yet another, more technical, way of saying this would be that observations made in an accelerating reference frame are indistinguishable from observations made in a classical Newtonian gravitational field. This is the principle of equivalence, and it is the heart of general relativity. While this may seem unintuitive at first, it is not so hard to imagine and get a grip on. Look at the spaceship shown in Fig. 1 (in the next section, below) and imagine that you are standing on its floor while it is standing upright on the surface of Earth, on the launch pad at Cape Kennedy, say. You would be pressed against the floor by gravity, just as you are when standing anywhere else, like on the street. If you stood on a weighing scale, it would register your weight. Now imagine that you are in deep space in the same ship, far from any planets, stars, or other masses, so that there is no gravity acting on you or the spaceship. If the spaceship were accelerating forward (the direction which is up in Fig. 1), you would be pressed against the floor, just as when an airplane accelerates quite fast down the runway on its takeoff roll, you are pressed in the opposite direction against your the back of your seat. If the acceleration were exactly fast enough, you would be pressed against the floor of the spaceship with the same force as your weight, and at this rate of acceleration, if you stood on a weighing scale, it would again register your weight. You would be unable to tell whether you were accelerating in deep space or standing still on the surface of Earth. (You could perform all of Galileo's experiments inside the spaceship, dropping objects, rolling them down inclined planes, etc., and they would give the same results as here on Earth.) Are you with me? What I am saying is, for a gravitational field of a given strength in a given direction (like that at Earth's surface toward its center), there is a corresponding rate of acceleration in the opposite direction which is indistinguishable from it. I am afraid of losing some people here, so let me pump your intuition with a few examples. Have you ever been on one of those rides in an amusement park (the one I went to was called the Devil's Hole) where you stand in a circular room against the wall, then after the room starts spinning quite rapidly, you are pressed strongly against the wall and then the floor drops away? It can be scary, but is safe because you are accelerating (moving in a circle) and this presses you to the wall just as gravity would if you turned the whole circular room on its side (like a Ferris wheel) and lay on the side of it which is touching the ground. Most gravity defying stunts, like motorcyclists riding inside a wire cage in the shape of a sphere, rely on the effects of acceleration to cancel gravity. You've probably seen astronauts on TV training for weightless environments inside aircraft where they are floating about. This also exploits the principle of equivalence: if the plane accelerates downwards at the same rate as a freely falling object would, this will produce what could be described as an upward gravitational force inside the plane, and this cancels gravity. Of course, from an outside perspective, looking through the plane windows, it just seems that the plane and the people in it are both falling at the same rate, which is why they seem to be floating inside it. But inside the plane, if you have no windows, there is no way to tell whether you are far away from any gravitational field, or simply accelerating in its direction. All this really should become quite clear if you think about it for a bit. Reread the last couple of paragraphs if you have to. Consider the leftmost three drawings of the spaceship in Fig. 1. They show the spaceship accelerating upward. Remember, this does not mean that it is moving upward with a steady speed. It means that it is getting faster and faster each instant. In other words, its speed is increasing. Now we have an object, say a ball, which is moving at a steady (fixed) speed across the path of the spaceship from left to right in a straight-line path perpendicular to the direction the spaceship is moving and accelerating in (up). Suppose, further, that there is a little hole in the spaceship just where the ball would strike the exterior left wall of the spaceship, which allows the ball to enter the spaceship without ever touching any part of it. Imagine that the spaceship is made of glass and is transparent, so you can see what happens inside. If you are standing outside the spaceship, what you will see is what is shown in the leftmost three drawings of the spaceship in Fig. 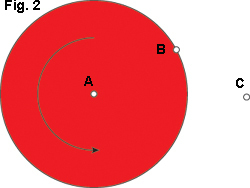 1, i.e., the ball will continue in a straight line on its previous path (shown in the figure as a dotted line), while the spaceship accelerates up around it (while the ball is inside the ship). Here's the weird part: now imagine yourself standing still on the floor of the spaceship as it accelerates upward. You experience gravity which presses you to the floor, as described above. Now, you see the ball enter from the window in the left wall, and what you see is that it follows a parabolic arc down and hits the opposite wall much lower than the height at which it entered (shown in the rightmost drawing of Fig. 1) just as it would because of gravity if the spaceship were standing on the launchpad at Cape Kennedy and someone threw a ball in horizontally through the window. Do you see? One man's acceleration is another man's gravity! You can probably guess what's coming next: now imagine the the ball is replaced with a ray of light. Exactly the same thing will happen to it. The light will follow a parabolic arc downward and hit the opposite wall below the height at which it entered the spaceship, when seen by the person inside. The reason that you normally don't see light bending in any spaceships is that light travels so fast. In the billionths of a second that light takes to get from one wall to the other, the spaceship doesn't move up much (maybe billionths of an inch) because it is moving much slower than light moves. This small a deflection is impossible to measure. (This is just as you don't see a bullet fired horizontally bending down much over a short distance, even though it is following a downward parabolic path to the ground. And light is a lot faster than bullets.) This bending of light must be true as long as we assume the principle of equivalence to be true, because if it weren't, we could then perform optical experiments on the ship to decide whether we are in an accelerating frame or a gravitational field. This is forbidden by the principle of equivalence. And since we now see that light will bend in an accelerating spaceship (seen by someone in the ship) and since we also know that the person in the ship by definition has no way of knowing whether she is accelerating or in a gravitational field, light must also bend in a gravitational field. (Otherwise the person would know she is accelerating.) It's really that simple! The most famous experiment which confirmed the correctness of GR and made Einstein world famous overnight, was the observation of the bending of starlight by the Sun's gravity in 1919, which I mentioned briefly in my June SR column. Also, in case you are wondering why light is bent by gravity even though photons have no mass at rest, it is because light is a form of energy, and as we know from special relativity, energy is equivalent to inertial mass according to E = mc2. All energy gravitates. This time, let's consider what happens with a rotational motion. Look at Fig. 2. It shows a huge disk. Imagine that we put two clocks on the disk: one at the center at point A, and one at the edge at point B. Also put a clock at point C, which is on still ground some distance from the disk. Now imagine that the disk starts rotating very fast as shown by the arrow. Now we know that the clocks at points A and C are not moving with respect to each other, so they will read the same time. But we also know that clock at B is moving with respect to the ground, and by the principles of special relativity must be running slower than C. And since C must be running at the same rate as A (they are not in motion relative to one another), B must also be slower than A. This will be true for an observer at C on the ground as well as at A on the disk, but their interpretations of why the clock on the edge at B is slower will be different: for the ground observer at C, the clock at B is in motion, which is what slows it down. For the observer at A, however, there is no motion, only a centripetal acceleration toward the center of the disc, and it is this acceleration which accounts for the slowing down of the clock. The further A moves toward the edge, the stronger the centrifugal force (and the centripetal acceleration), and the slower the clock he has runs. Since acceleration is indistinguishable from gravity (A has no idea if he tends to experience a force toward the outside of the disk because the disk is rotating, or whether the disk is still and he is in a gravitational field), clocks must also slow down in gravitational fields. This slowing down of time by gravity has been confirmed by experiments to a very high precision. We just looked at time. Let's see what happens with space. Take the same disk from Fig. 2 and replace clock B with a ruler. Place the ruler at B so that it is tangent to the disk. For the same special relativistic reasons that the clock at B will run slower, the ruler at B will be contracted in length. Use another ruler to measure the radius from A to B. since the rotational motion on the disk is always perpendicular to the radius, this will be unaffected by motion. Since only the ruler at B is affected, if that ruler is used to measure the circumference of the disk, the ratio of that measured circumference and the measured diameter will not be Pi (3.1415926...), but a smaller number, depending on the rate of rotation of the disk. This is a property and an indication of a curved surface. But the rotation (accelerated motion) is equivalent to a gravitational field as we have already seen, so we can say that gravity causes space to become curved. There is much, much, much, more to this grand theory, and I have but drawn a crude cartoon of it here in the small hope that I might impart a bit of its flavor, and indicate the direction in which Einstein moved after publishing special relativity in 1905. Andrew, this is the best I can do. Thanks to Margit Oberrauch for doing the illustrations.